In June 2018, Blackboard released this new report featuring data from Speak Up 2017 on a new cohort of school leaders who are rethinking instructional practices, providing a bold vision for the future of their schools, leading by example and supporting their teachers through this transition. Based upon landmark research from Project Tomorrow, a new class of school principal is emerging. This new school site leader brings to the challenge of the position a set of skills and values that inherently emphasize the importance of personalized learning and effective school to home communications. 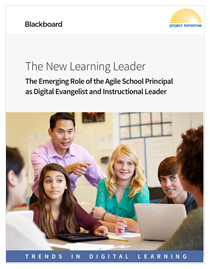 We are calling this emerging principal profile the “New Learning Leader” as they embody the dual capacities of instructional leader and digital evangelist initiating and nurturing new modes of online and digital learning. The New Learning Leader values the potential of technology to create more personalized learning while at the same time appreciating what it takes to bring their teachers along in the process. In other words, they lead from both the front and the back. The New Learning Leader has a clear vision as to how to translate a district mission of equity, achievement and outcomes into actual practices within the classroom, working to motivate their teachers to adopt these new methodologies while at the same time being the cheerleader and communicator to the parents on the value of these new learning environments for their children. The New Learning Leader is ahead of the pack in terms of rethinking existing instructional practices and energizing their staff and community to be bold in visioning for the future, while at the same time reacting effectively to new challenges and reinventing educational outcomes that meet both student and community needs. Understanding the activities, attitudes and aspirations of this emerging cohort of school principals helps to drive both enhanced expectations and appreciation for the critically important work of school leaders today. District leaders are increasingly placing a high value on the leadership skills of their school site administrators. 40% of education leaders now say that enhanced school leadership has the potential to result in improved student outcomes relative to college and career readiness, only 11% held the same view in 2010. A new type of school principal, the New Learning Leader, is emerging that is both a digital evangelist at their school supporting new classroom models and an instructional coach providing modeling for their teachers about effective technology use for professional tasks. The New Learning Leader is more likely than other principals to have implemented blended, competency-based or flipped learning environments at their school. While 51% of all principals say that they have implemented blended learning at their school, 74% of these new principals are at the helm of a blended learning school. Two-thirds (68%) of New Learning Leaders say that their most significant challenge in the effective use of digital resources at their school is providing effective teacher training. Consequently, these principals have a stronger focus that most principals on modeling self-directed professional learning for their teachers. The New Learning Leaders are using data to inform their leadership tasks including providing feedback to their teachers on how to improve classroom practices (89%), setting schoolwide goals (85%) and sharing information with parents (74%). Each year since 2003, Project Tomorrow, a global education nonprofit organization, facilitates the annual Speak Up Research Project on Digital Learning. A key aspect of the research project is to track the growth in student, educator, and parent interest in digital learning, as well as how our nation’s schools and districts are addressing that interest by supporting innovative learning experiences in and out of the classroom. Since 2007, Project Tomorrow has collaborated with Blackboard to create a series of annual reports that focus on the year-to-year trends in the use of digital learning tools to change the classroom-learning paradigm through an in-depth analysis of the latest Speak Up data findings. In this Digital Learning Trends report, we examine the trends revealed through our analysis of the Speak Up data collected in fall 2017. More than 406,000 K-12 students, parents, educators, and community members participated in Speak Up 2017 and their authentic feedback representing over 10,000 schools is the foundation for this report.